As of this time the source-code of PRINCE has not been released. Therefore this description is based solely on At0m's Passwords14 presentation, talking to At0m himself on IRC as well as running experiments with various small dictionaries using the tool itself and manually looking at the output. This is a bit of a mixed bag. While it certainly saved the highest keyspace chains for the end, it didn't output everything in true increasing keyspace order since elements of length 1, (E1), had two items, while elements of length 2, (E2), only had one item, but it outputted E1 first. I have some suspicions that the order it outputs its chains is independent on how many items actually are in each element for that particular run, (aka as long as there is at least one item in each element, it is independent of your input dictionary). I don't have anything hard to back up that suspicion though beyond a couple of sample runs like the one above. Is this a problem? Quite honestly, I'm not really sure, but it is something to keep in mind. When I talked to Atom about this he said that password length compared to the average length of items in the training set also influenced the order at which chains were selected so that may have something to do with it. --elem-cnt-max=NUM: This limits the number of elements that can be combined to NUM. Aka if you set NUM to 4, then it can combine up to 4 different elements. So if you had the input word 'a' it could generate 'aaaa' but not 'aaaaa'. This may be useful to limit some of the brute forcing it does. The rest of the options are pretty self explanatory. One request I would have is for PRINCE to save its position automatically, or at least print out the current guess number when it is halted, to make it easier to restart a session by using the "--skip=NUM" option. PRINCE was written by Atom so of course it is fast. If you are using a CPU cracker it shouldn't have a significant impact on your cracking session even if you are attacking a fast hash. For comparison sake, I ran it along with JtR's incremental mode on my MacBook Pro. What I wanted to point out was that for a fast hash, (such as unsalted SHA1 in this case), since PRINCE is not integrated into OCLHashcat it can't push guesses fast enough to the GPU to take full advantage of the GPU's cracking potential. In this case, the GPU is only at around 50% utilization. That is a longer way of saying that while you still totally make use of OCLHashcat when using PRINCE, it may be adventurous to also run dictionary based rules on the guesses PRINCE generates. Since those dictionary rules are applied on the GPU itself you can make a lot more guesses per second to take full advantage of your cracking hardware. This is also something Atom recommends and he helpfully included two different rulesets with the PRINCE tool itself. Side note: PRINCE plows though the LinkedIn list pretty effectively. To get the screenshot above I had to run the cracking session twice since otherwise the screen would have been filled with cracked passwords. When talking about passpharse attacks then, keep in mind it doesn't have any advanced logic so you are really doing a full keyspace attack of all the possible combinations of words. The big question then is how does it compare against other attack modes when cracking passwords? You know what this means? Experiments and graphs! I decided I would base my first couple of comparisons using the demos Atom had listed in his slides as a starting point. I figure no-one would know how to use PRINCE better than he would. Note: these are super short runs. While I could explain that away by saying this simulates targeting a slow hash like bcrypt, the reality is Atom made some noticeable changes in PRINCE while I was writing this post, (yay slow update schedule). I figured it would be good to make some quick runs with the newer version to get a general idea of how PRINCE performs and then post a more realistic length run at a later time. Also, this way I can get feedback on my experiment design so I don't waste time running a longer cracking session on a flawed approach. The input dictionary for PRINCE was the top 100k most popular passwords from the RockYou list, as this is what Atom used. For Hashcat I generated a stats file on the full RockYou list and used a limit of 16. For JtR I ran the default Incremental mode using the "All" character set. The target list was the old MySpace list. The reason why I picked that vs the Stratfor dataset which Atom used was simply because there are a ton of computer generated passwords, (aka default passwords assigned to users), in the Startfor dataset so it can be a bit misleading when used to test against. This is the same as the previous test targeting the MySpace dataset, but this time using dictionary attacks. For JtR, I stuck with the default ruleset and the more advanced "Single" ruleset. I also ran a test using Hashcat and the ruleset Atom included along with PRINCE, (prince_generated.rule). 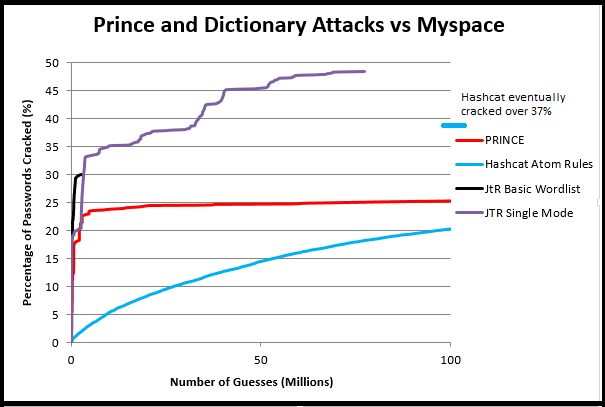 For all the dictionary attacks, I used the RockYou top 100k dictionary to keep them comparable to the PRINCE attack. Cracking Length: I gave each session up to 1 billion guesses, but the two JtR attacks were so short that I only displayed the first 100 million guesses on the graph so they wouldn't blend in with the Y-axis. The hashcat attack used a little over 700 million guesses which I annotated its final results on the graph. Side note, (and this merits another blog post), but Hashcat performs its cracking sessions using word order, vs JtR's rule order. I suspect this is to make hashcat faster when cracking passwords using GPUs. You can read about the difference in those two modes in one of my very first blog posts back in the day. What this means is that Hashcat's cracking sessions tend to be much less front loaded unless you take the time to run multiple cracking sessions using smaller mangling rulesets. As you can see, all of the dictionary attacks performed drastically better than the PRINCE over the length of their cracking sessions. That's to be expected since their rulesets were crafted by hand while PRINCE generates its rules automatically on the fly. I'd also like to point out that once the normal dictionary attacks are done, PRINCE keeps on running. That's another way of saying that PRINCE still has a role to play in a password cracking session even if standard dictionary attacks initially outperform it. All this test points out is if you are going to be running a shorter cracking session you would be much better off running a normal dictionary based attack instead of PRINCE. This does lead to my next question and test though. 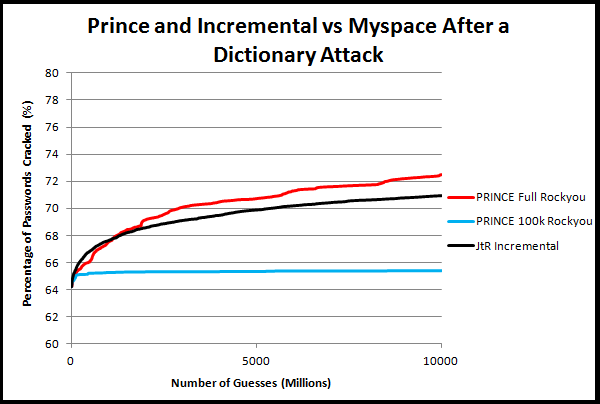 After you run a normal dictionary attack, how does PRINCE do in comparison to a Markov brute force based attack? Based on feedback from Atom I decided to restructure this next test. First of all, Atom recommended using the full Rockyou list as an input dictionary for PRINCE. Since that is a larger input dictionary than just the first 100k most frequent passwords, I re-ran JtR's single mode ruleset against the MySpace list using the full Rockyou dictionary as well. I also used the most recent version of JtR, 1.8-jumbo1 based on the recommendation of SolarDesigner. This cracked a total of 23,865 passwords from the MySpace list, (slightly more than 64%). I then ran PRINCE, (the newer version 0.13) with the full RockYou dictionary, (ordered), and JtR Incremental=UTF8, (equivalent to "ALL" in the older version of JtR), against the remaining uncracked passwords. I also increased the cracking time to 10 billion guesses. I'll guiltily admit before running this test I hadn't been that impressed with PRICE. That's because I had been running it with the top 100k RockYou dictionary. As you can see, with the smaller dictionary it performed horribly. 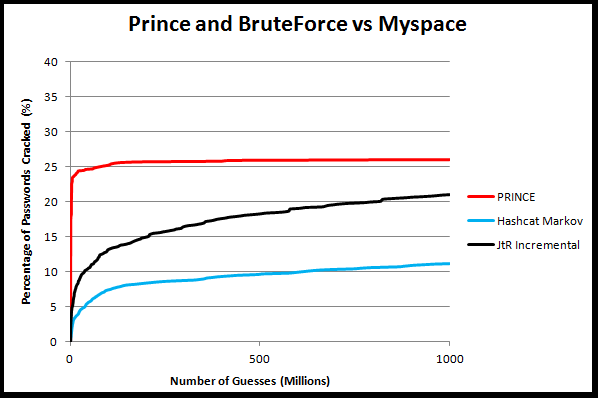 When I ran the new test with the full RockYou dictionary though, PRINCE did significantly better than an Incremental brute force attack. Yes, cracking 1.5% more of the total set might not seem like much, but it will take Incremental mode a *long* time to catch up to that. Long story short though, PRINCE's effectiveness is extremly dependend on the input dictionary you use for it. Like most surprising test results, this opens up more questions then it solves. For example, what exactly is going on with PRINCE to make it so much more effective with the new dictionary. My current hypothesis is that it is emulating a longer dictionary attack, but I need to run some more tests to figure out if that's the case or not. Regardless, these results show that PRINCE appears to be a very useful tool to have in your toolbox if you use the right input dictionary for it. Can we make PRINCE smarter? Right now it transitions between dictionary attacks and brute force automatically, but beyond sorting the chains by keyspace it doesn't have much advanced logic in it. Perhaps if we can better understand what makes it effective we can make a better algorithm that is even more effective than PRINCE. You need to know, there are two different algorithms that can influence each other. The first one is the algorithm of prince that sorts by keyspace, the second one is the algorihtm that selects the number of password candidates of a specific length X. One can overrule the other one. But, all in all, it is no problem in a real life scenario when a user chooses a realistic output length distribution by using a big enough base wordlist. In that case that problem will not occour. No, that's not the element. That's the table (I did not name this explicitely in the slide but in my talk). An element is a word from your wordlist. 1. The element length doesn't matter at all. 2. There can be an output password candidate of length 20 for example, all it needs it 4 elements of length 5, or 3 of length 1 and 1 of length 17. > I expected I would see the guess "BigInputaa", but it was nowhere to be found. During the course of my testing, I noticed several other instances of missing chains. > Finding #2: PRINCE is not guaranteed to output all chains even if those chains have elements. I.E. it will not perform a full keyspace attack. > --elem-cnt-max=NUM: This limits the number of chains that can be combined to NUM. Aka if you set NUM to 4, then it can combine up to 4 different chains. No, that means that the total maximum number of elements per chain is 4. For example if the password candidate output length is 8, then there is a total of 128 possible chains. One of them consists of only 1 element, but the others of 2 or more. But only those that consists between the range given with --elem-cnt-min and --elem-cnt-max are allowed and used. Makes sense, will add it. > The main question of course is how does this tool fit into a cracking session? I'd say run your rule based attacks first as rule based attacks at the most efficient ones around. But they will exhaust and thats the disadvantage with them. So if you did not succeed to crack the hash in rule based attack mode, start prince afterwards. Of course prince is brand new and I am fixing "teething problems". ATM the latest release version is v0.13. Please do not truncate rockyou.txt by any number of top words. Use it as it is. Statsprocessor is a standalone tool but think of it more like a "test-program". Also v0.10 seems a bit strange as the latest release version is 0.08. I know there was also a beta version but I never released them because of the above reasons. I'm not really sure why you used hashcat CPU and rules in here. Actually, the rules are not meant to be used alone. It's meant to have princeprocessor feeding words into your cracker and your cracker reading from stdin should also apply those rules. 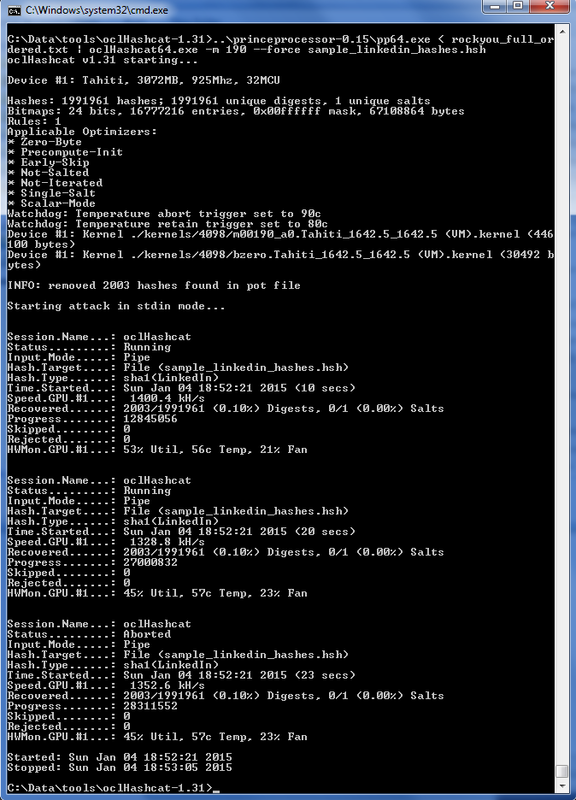 That's a special workaround to have tools like oclHashcat running in full speed while cracking a fast hash. 2. You did not add the optional personal aspect feature. This makes it in some kind unique compare to any other attack mode. Hey Atom thanks for explaining that! I'll make some of the terminology changes when I update this entry. Aka, for the --elem-cnt-max=NUM description I meant elements like you described so that was simply a terminology mistake on my part. > Please do not truncate rockyou.txt by any number of top words. Use it as it is. >Also v0.10 seems a bit strange as the latest release version is 0.08. I was running the tests on my Mac, which meant hascat vs oclhashcat. Also I wanted to run a *hashcat attack since I feel there is a big disconnect between the Hashcat and JtR communities and I want to avoid that as much as possible. While I like JtR from a research standpoint and that's the tool I'm most familiar with, Hashcat is an amazing tool so I want to show examples with that as well. > You did not add the optional personal aspect feature. Part of that is I'm not sure how I'd model the experiment against the MySpace list to take advantage of a targeted dictionary against a group or person, (well I could use some myspace related words but that wouldn't have a huge impact). With princeprocessor v0.18 I changed something to the ordering of password lengths. The change hopefully makes the output more like you would expect it, more like you have described it to be in your section "Algorithm Design". Could you check please? I find it somewhat misleading that the graph says "JtR single mode" while it's actually wordlist mode using single-mode rules. I did not realize what it really was until I read your command lines. When there are user/gecos data available, the real single mode is astonishing, especially for salted hashes.